VDx has a full service histology laboratory offering everything from standard paraffin embedding with routine hematoxylin and eosin (H&E) staining, to advanced histochemical special stains, and immunochemical stains. 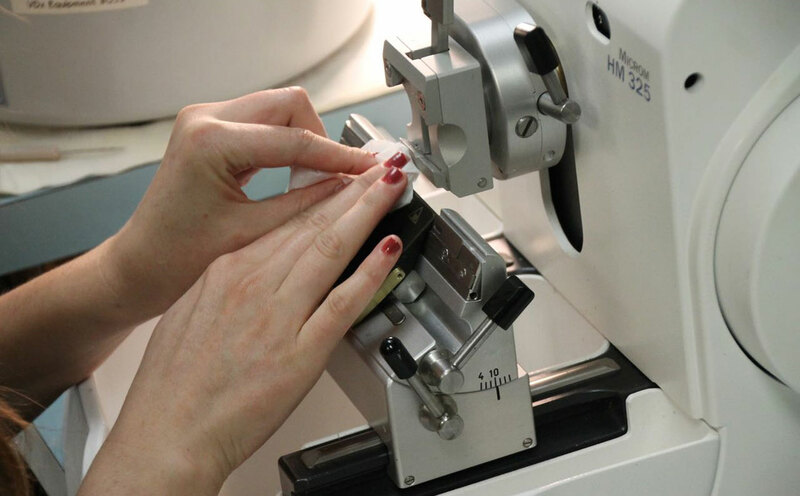 Our experienced histology technicians are all fully trained and proficient. Formalin fixed tissues are processed on fully automated processors through graded alcohols, xylenes, and infiltrated with paraffin. These tissues are then embedded by hand in a paraffin wax, sectioned on a rotary microtome at 3-5 microns, and mounted on glass slides for staining. Hematoxylin and eosin (H&E) staining is the most commonly used stain for histopathologic analysis. This stain allows for visualization of nuclei, cytoplasm, erythrocytes, collagen, and other cell and tissue structures. VDx offers a wide array of special stains to help you get the best results for your study. Listed below are our most commonly performed stains. Please contact us if you do not see the stains you need listed or if you have any questions regarding special stains. VDx has been performing immunochemical staining on histology and cytology samples since 2009. Please contact us to discuss the details of your project and we can assist in setting up and implementing an IHC staining protocol to suit your study’s specific needs.